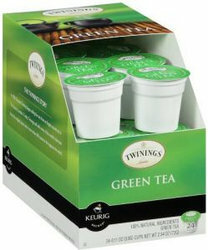 Twinings Pure Green Tea K-Cups (24 Count). Green tea is known for its smooth flavor and refreshing taste. Green teas are made from leaves of the Camellia Sinensis plant, the same leaves as black tea. Green teas go through a process where the leaves are heated to prevent oxidation while black teas are oxidized for additional color and flavor. The result is a delicious tea that brews to a light golden colour and unique flavor. Each box contains 24 single serve K Cups. Product Note: Twinings Green Tea is a style called "Sencha", known for it's smooth, mild characteristics.